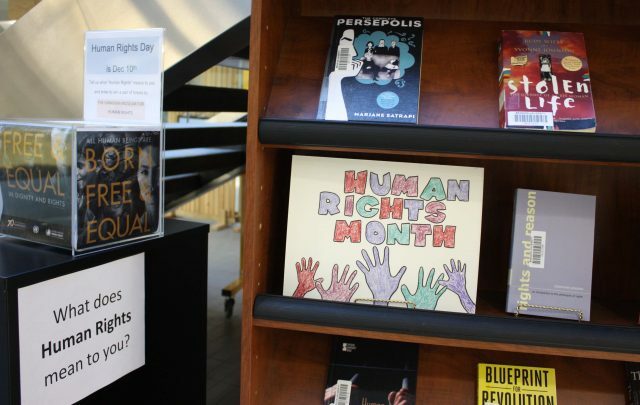 A display of books on Human Rights and entries for a free draw to win tickets to the Canadian Museum for Human Rights can be found at the John E. Robbins Library. Another ballot box is set up in the Mingling Area of the Knowles-Douglas Students' Union Centre. Brandon University (BU) is celebrating the approach of Human Rights Day on December 10. Human Rights Day marks the anniversary of the signing of the Universal Declaration of Human Rights. The Declaration, signed by the United Nationals General Assembly on December 10, 1948, sets a standard of rights and goals for people and nations around the world. This year will kick off of a year-long celebration, leading up to the 70th anniversary of the signing in 2018. At BU, a display of books on human rights has been set up in the John E. Robbins Library. Additionally, ballot boxes are stationed at the library and in Mingling Area of the Knowles-Douglas Students’ Union Centre, with a free draw to be held for tickets to the Canadian Museum for Human Rights in Winnipeg. Other ballot boxes are located at the BU campuses in Winnipeg and Dauphin. Entries may also be sent by email to Lisa Park, BU’s Diversity and Human Rights Advisor, at ParkL@BrandonU.ca. Learn more about the Universal Declaration of Human Rights by visiting standup4humanrights.org.